The world’s most famous yellow submarine has returned home after a successful mission to Antarctica’s Weddell Sea. 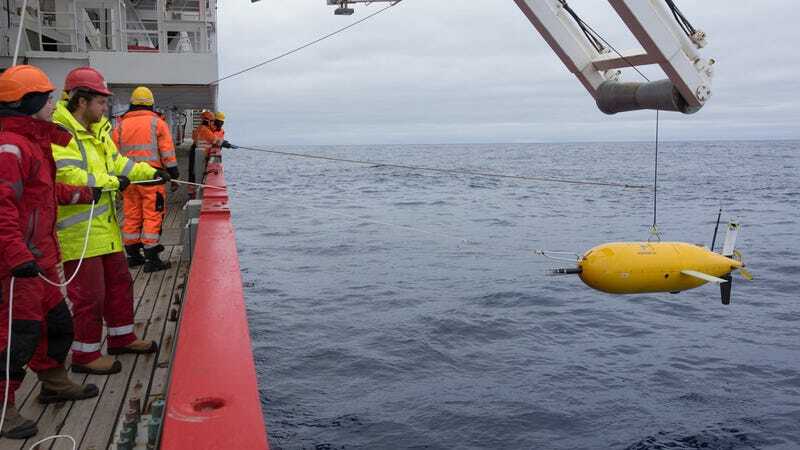 Expedition organizers say Boaty McBoatface captured “unprecedented” data during its maiden voyage, analyzing deep sea currents at depths exceeding 13,000 feet. Boaty’s back in Britain, along with the crew of its mothership, the Sir David Attenborough. The mission, which involves scientists from the British Antarctic Survey, the National Oceanography Centre, and Southampton University, is an effort to study one of the coldest deep sea currents on Earth—a frigid abyssal realm known as the Orkney Passage. By mapping this ocean current in detail, scientists are hoping to gain a better understanding of the dynamics behind ocean mixing and how it affects climate change. The name of this submersible, in case you’ve forgotten, comes from a 2016 campaign by the Natural Environment Research Council to name the UK’s new polar research ship. The public voted for Boaty McBoatface, but the British government, lacking a sense of humor, refused to let that happen, choosing to name the ship after naturalist Sir David Attenborough. To appease the masses, an autonomous yellow submarine was dubbed Boaty McBoatface instead. Over the course of its inaugural seven week mission, Boaty travelled over 110 miles (180 km), reaching depths of 13,100 feet (4,000 meters) where waters reach subzero temperatures. Boaty’s work was done in the Weddell Sea about 500 miles (800 km) from the Antarctic Peninsula. As it traversed up and down the Orkney Passage, Boaty used its onboard instruments to measure water temperature, the speed of water flow, and turbulence rates. Instruments aboard the ship also took measurements. To visualize the progress of Boaty, the researchers created an animated fly-through of the passage. Boaty completed three missions during its expedition, the longest of which lasted three days. The sub ran into some difficulty at the start of one mission, after it swam through a swarm of krill so dense its radar thought it was about to smash into the seafloor. The autonomous sub was redirected back to the surface, even though it was just 260 feet (80 meters) down. With everyone back home and dry, the researchers will now begin to analyze and interpret all of this exciting new data. At the Orkney Passage, deep sea currents go through a “chokepoint” as they head from Antarctica’s Weddell Sea to the Atlantic Ocean. These currents acts as a kind of underwater conveyor belt, bringing cold water to the planet’s equatorial regions. Scientists are concerned that changing winds over the Southern Ocean are creating warmer water layers, which could be changing the dynamics of the deep sea current. Good work, Boaty! Thanks to your stupendously ridiculous moniker, we actually care about you and your important mission.